A high-powered delegation of the state’s business and political leaders has been given a crash course in the science of nuclear storage in Finland, and the biggest single message it has learned is the value of keeping the community onside. Committee for Adelaide's Matt Clemow and Business SA's Nigel McBride at a nuclear repository in Finland during their recent European delegation. InDaily revealed last month that the self-funded working party would undertake a tour of nuclear sites across Europe ahead of nuclear fuel cycle royal commissioner Kevin Scarce’s final report next month. They touched down in Finland over the long weekend and toured the Olkiluoto Nuclear Power Plant overnight, Australian time, along with the adjoining Onkalo spent nuclear fuel repository being constructed nearby. Business SA chief executive Nigel McBride told InDaily the tour group was taken 60 metres underground into the bedrock of the existing low to medium waste facility and viewed a model of the planned high-level repository – which will be 420 metres deep. “It looks very simple, but of course it’s incredibly complex – an amazing use of technology,” said McBride, who filmed the presentation on his mobile phone. But he said the plant’s operators main theme was about thorough and ongoing community consultation. “They really made a point of taking the community with them,” he said. Matt Clemow, general manager of the Committee for Adelaide, who organised the delegation, said the first day of the tour gave him “a great deal of confidence” that it was a worthwhile exercise. “We’ve had the joint venture partners present to us this morning… they consider the community’s acceptance of the nuclear fuel industry to be an everyday exercise – and an ongoing exercise – to ensure that people continue to have that community acceptance that it’s safe and provides economic benefits,” he said. 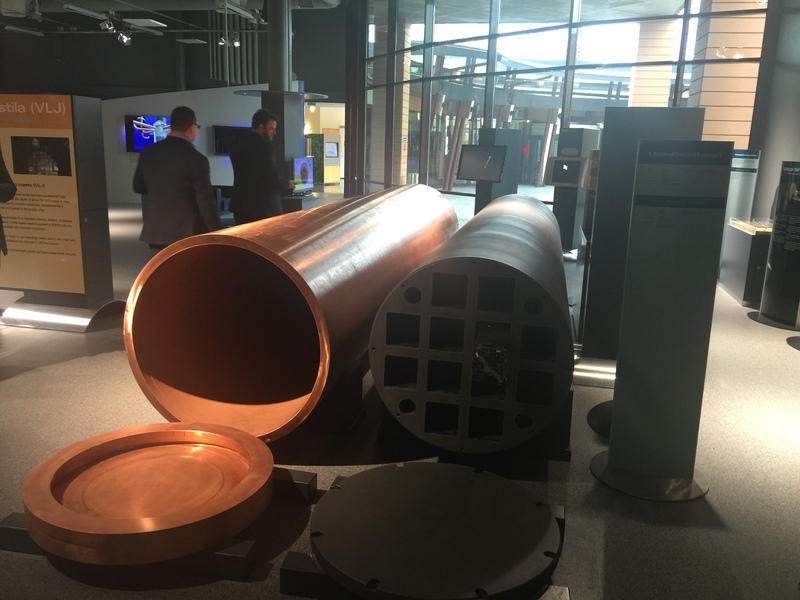 Real-size model of a copper sheath and insert, which will contain the spent fuel rods. Clemow said the fundamental difference for what’s proposed in SA through Scarce’s tentative findings – which found a multi-billion-dollar business case for a high-level world-class storage facility in the state’s outback – was that there was no corresponding proposal for the establishment of a nuclear power plant. “Whilst a lot of the overseas debate is about ‘should we store what we use?’, our debate is about ‘should we store what other people use… after we create it in the first place [through uranium mining]?’” he said. What was the real Chernobyl death toll? “There’s a reasonable nuance there… I think the most important thing is in the separation of nuclear power and spent fuel disposal. McBride noted a cultural distinction, given the Finns “believe that because they use nuclear power it’s their responsibility to deal with the waste”. “They’ve changed the law so they can no longer export nuclear waste – they believe it’s their duty to deal with it,” he said. Whether or not South Australia can make a similar moral case for nuclear storage, McBride says: “If you can’t bring the community with you, don’t bother”. “Their whole process [in Finland] has been very careful,” he said.